Figure 1. Buck − Typical Application Schematic. The LYTSwitch™-7 family is ideal for single-stage, high PF, constant current LED dimmable applications. The family incorporates a high-voltage MOSFET with a variable on-time CrM controller. Extensive protection features with minimum external components provide industry leading power density and functionality. LYTSwitch-7 devices are suitable for applications from 4 W to 22 W. See Graph 1 for selection guidance based on typical inductance. 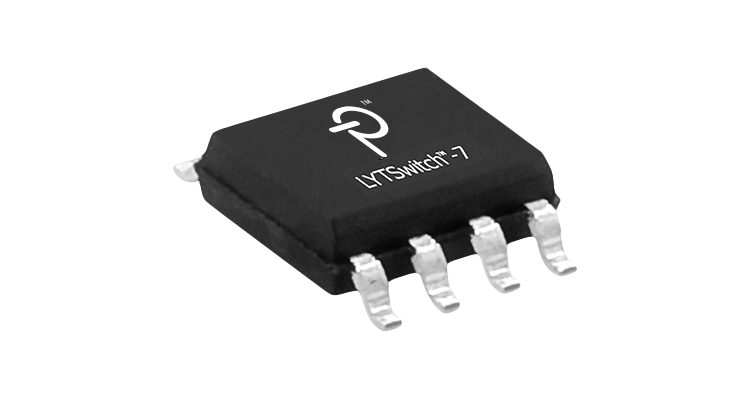 LYTSwitch-7 peak current mode operation is suitable for TRIAC applications without the need of an active bleeder. Maximum practical continuous power in an open frame design with adequate heat sinking, measured at 50˚C ambient. Output power graph based on typical value in inductance, ILIMIT(AR), T ON(MAX) and package thermal limitations.